For over a quarter of a century, The BRIT School for Performing Arts & Technology, has been giving its pupils an incredible grounding in the performing arts and the technology surrounding them. 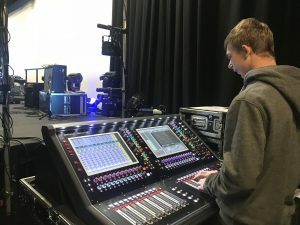 To this end, one of its latest investments is the DiGiCo SD12 consoles chosen, says Andrew Smith (Technical Manager at the school), because they offer a platform that not only makes sense for the range and requirements of the school’s performances, but also because they offer the most relevant experience for students that will soon be looking for a job in the industry. 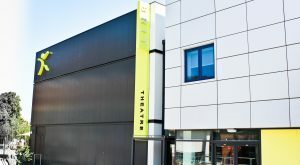 Situated in Croydon, South London, The Brit School is a state-funded school for ages 14 to 18 and is dedicated to ‘Education and vocational training for the performing arts, media, art and design, and the technologies that make performance possible’, as well as providing a core GCSE study programme. It boasts a list of highly successful alumni and lays claim to 99 per cent of graduating students going on to find work in the creative industries or enrolling in higher education. These impressive results are down to dedication, a carefully curated curriculum and equipment that allows its students to go out in the real world. 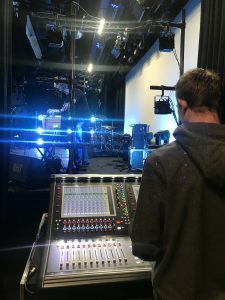 A major emphasis for the course is real-world production practice, with students from the Production Arts course providing lighting and sound requirements for its own productions. The intensity of the School’s performance programme was one of the driving factors that lead to a search for new consoles. “We have performances going on simultaneously in multiple venues, including our two fully-equipped theatres – the Obie Theatre (named after the late music exec Maurice Oberstein) and the BRIT Theatre,” explains Andrew. “Making a further investment DiGiCo SD consoles made absolute sense. We purchased two SD12s, which means we can train students on a tool that will allow them to work in a broad range of genres. The consoles were supplied and installed by HD Pro Audio, which has worked with the school since its inception in 1991. Sales Director Andy Huffer notes that the SD12 is particularly suited to its wide-ranging production and learning requirements. The integrated USB recording interface on the SD12 is also a key learning tool for the school. “If you’ve never engineered before, you can do prior training, but actually doing it for real is where you learn the skill of the quick decision making that’s needed,” says Andrew. “Then, in a calmer environment, you can analyse what you’ve done and improve on it. Outside the live performances we can use those recordings to give students a safe environment for learning to engineer.